This volume is a collection of essays written after an interdisciplinary symposium of the same title, held at Harvard University in October 2003 to commemorate 90 years since the publication of Lawrence J. Henderson’s The Fitness of the Environment. In general, the book considers whether the universe is ‘biocentric’ in some way; tailored or fitted for life. The concept of fine-tuning of the universe with respect to the value of different physical constants and how they define the broad architecture of the cosmos and permissible physical processes has been well-explored in the past. For example, astrophysicists point to the neat balance that allows the efficient synthesis of the element carbon in stellar cores. This new publication focuses more on possible quirks of chemistry that may be fine-tuned to promote the development of life – is the Anthropic Principle applicable to biochemistry as well? Chapters in the book discuss what features of the molecular construction of terrestrial life might be universal throughout the galaxy, and what may be idiosyncratic to us and constitute nothing more than frozen accidents of our own haphazard origin? Would E.T. be based on largely the same chemical systems as ourselves, or have a truly exotic biochemistry in comparison? The book also includes submissions of a much more theological or religious focus. 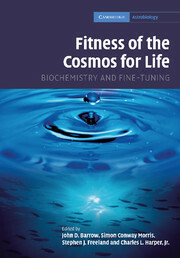 For me, highlights of the volume include Albert Eschenmoser’s chapter, which is a very eloquent explanation of the difficulties faced by biochemists (compared to cosmologists) in demonstrating any hint of fine-tuning, Christian de Duve on the chemical make-up of terrestrial life, and Eric Smith and Harold Morowitz on the optimisation of metabolism. Each chapter is written by forerunners in their field and there is some very interesting discussion in here, but the nature of Fitness of the Cosmos for Life, as a collection of essays, means that overall the book is lacking in structure and cohesion. Many of the chapters repeat each other’s introductory and stage-setting material, and the volume as a whole would have benefitted from an Introduction chapter that covered these explanations once right at the beginning that later chapters could simply refer back to. The Foreword does a good job of laying-out the complexity of the problem being addressed by the subsequent chapters, but a Conclusion chapter drawing together all of the disparate chapters would have been a very useful addition.